West coast swing is generally regarded as one of the most challenging social dances to learn. In this article we will explore some of the reasons why WCS can be challenging in order to help dancers understand why learning WCS can be difficult. It’s not just you! WCS is tricky for all of us. West Coast Swing is well worth the challenge, but it’s also worth acknowledging that this is a demanding dance, and that it’s natural to have moments of frustration. I’ll also try to offer up a couple quick tip resources the will help you along your journey. So lets dig in shall we? 1. Triple steps are hard. Very few social dances use triple steps because they require a strong sense of rhythm to place the & and they demand a high level of control over the body center during the triple. They are often hard for beginners and still difficult for advanced dancers to master. Read more about mastering the triple step here. 2. Dancing in open position requires a good frame. There are a lot of ways for closed position dancing to compensate for a weak frame. In open position, if you don’t maintain your own frame then you’re lost. There is a great free video about dealing with different connections on the top this page. 3. WCS is not a mirrored dance. 4. Anchoring and elasticity are high-level concepts. Not only are these concepts tricky for beginners to master, they are also fundamental to the dance. In a way its one of the reasons that make WCS so unique. Elasticity is needed not only on your anchor step, but in hidden places like the coaster step in the whip. Learning to stay back on the anchor is WCS 101. 5. West coast is inherently off-phrase. It will really help unravel wcs musicality for you! 6. WCS is a conversation. Dancers are expected to not just perform their role, but to adapt to what their partner does during the dance. This requires both partners to learn lead and follow skills. Once you are past being comfortable with your basics its good to learn when and how you can take advantage of the freedom of wcs. 7. There is a huge range of musical styles and tempos. Extreme slow and fast requires a high level of body control, and expressing different genres requires a broad range of movements. WCS even changes the way that patterns are counted based on the music (straight vs. rolling)! Looking for some WCS music to practice to? Check out our WCS music page. In short, it’s OK to feel like west coast swing is a difficult dance. It is! The key is to remember that this difficulty is not created just to mess you up—all of these challenges give WCS a huge degree of freedom and flexibility. Putting time into mastering these skills has a huge payoff precisely because developing talent at WCS forces you to learn a lot of solid dancing skills. Want to be part of the ‘cool kid club’ of WCS? Seriously though I want to give something to you! PS if you are a beginner you’ll want to sign up for the free videos but you’ll also want to check this out! Thank you so much, we have learned some of your steps and have had a great time dancing. Keep up the motivation! It is great to have you to help the WCS dance lovers to develop and improve our dancing! Thanks for all that you do Brian B.! Thanks Carmen! I’m doing my best. Thanks for paying attention. We are having a blast sharing cool stuff. I need an awesome partner with more ability than I have and who loves dancing and over 5’6. Good luck in your search and your dancing. Thank you Brian for your expert advise! Great tips & encouragement. 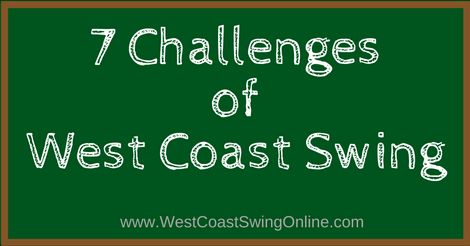 What a great summary of the challenges of West Coast Swing! I have often tried to explain to non-WCS dancers why West Coast Swing is so different from, and more difficult to learn than, other social dances. I typically mention that it’s not a mirrored dance (#3) and that it has wide range of musical styles and tempos (#7). However your article is an excellent summary of all the major challenges, and resulting benefits, of dancing West Coast Swing. Thanks for explaining how west coast swing uses triple steps, which require a strong sense of rhythm as well as a high level of control over the body. Since this can be hard for beginners, it would probably be important to find an instructor that you’re comfortable with and who is highly skilled in west coast swing dances. In order to find one, you’d probably want to find a dance club that is in the area and has instructors skilled in these steps so that you can get taught by someone who knows what they’re doing and is used to teaching people.